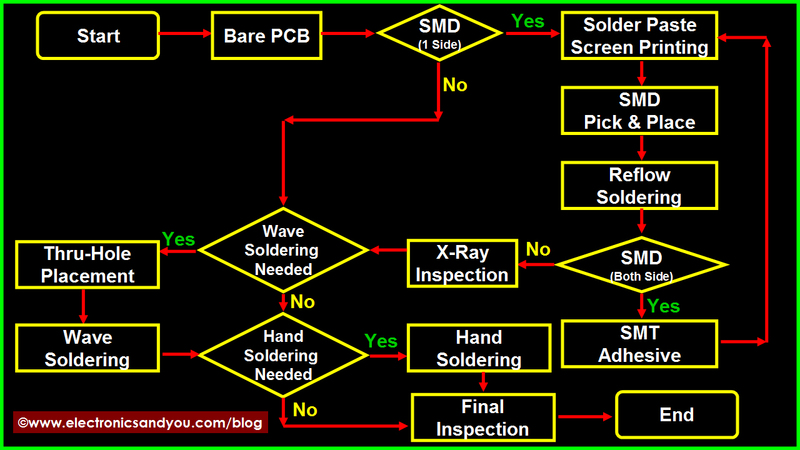 Wave soldering process is used for mass soldering of electronic components to PCB. Wave soldering process is used for mass soldering of electronic components to PCB. Wave of Molten Solder is Used in the Process, hence the name wave soldering. Wave soldering is the most widely used method in electronics industry for large scale mass soldering of through-hole electronic components to the PCB. Components glued to the bottom of a mixed-technology PCB require wave soldering, although the required wave geometry is different from that for through-hole electronic components. In the most common wave soldering process, the dual-wave type, one wave is turbulent and the other wave is smooth, as in conventional technology soldering. The need for wave soldering equipment can also be met by simply retrofitting the conventional solder pot with the dual pot for dip soldering – at a small fraction of the cost of a new machine. A completely new machine is not necessary. Another wave geometry for PCB Assembly that is popular for surface mounting in SMT is a vibrating single wave known as the omega wave. Like the dual wave geometry, it helps in reducing solder defects. The agitation provided by the dual or vibrating wave dislodges trapped flux gas that forms during wave contact and forces solder into areas with poor wetting angles. Proper component orientation is also very important. Some electronic companies have successfully used drag soldering equipment and techniques. Ideally, the wave or drag soldering process should be limited to soldering ceramic surface mount resistors and SMD capacitors. Small outline transistor (SOT) components are difficult to wave or drag solder. Wave and foam fluxers are generally used to apply flux to the board. Spray Fluxers are being used to apply very controlled amounts of flux, especially when no-clean fluxes are used. The development of an appropriate solder profile is important for best results.